Beginning April 1st at Whitney Art Works, artists Melinda Barnes, Tim Clorius, and Adriane Herman display multiple works in multiple formats that attest to the emphatic ability of the creative mind to observe, imagine and transform. 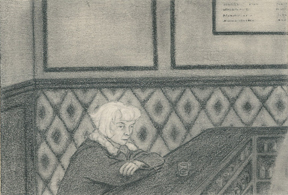 Each artist creates an intimate sort of archive: by voraciously condensing history and memory, as in Clorius’s paintings, through Barnes’s casting of invisible narrative webs to catch mysterious moments in the form of small drawings, and in the grace and compassion in Herman’s sticky note print collection. One would never expect that dashing “Cake in Fridge-Enjoy!” on a sticky note would warrant a devoted, painstaking translation into print. Nor that it could flutter from a gallery wall as a joyful, sensual, and monumental declaration of domestic tenderness. Neither could one know that the accumulation of day-to day note jotting presented by Adriane Herman could be so evocative of the human condition, that directing a loved one to eat cake would be so telling of intention, action, and the rhythm of domesticity. Herman calls this group of sticky note prints “sticky situations”, evoking the range of emotions in the notes from severe to sentimental, the way the notes adhere, unframed to the gallery wall, and the even the act of printmaking itself. Adriane Herman has exhibited nationwide including at the CMCA 2008 Biennial Juried Exhibition and at the Davis Museum at Wellesley College. Tim Clorius does not suffer from creative myopia. An agitated solution of politics, allegory, history, and the deeply personal, each painting frames an expertly positioned moment. In his work color has the fresh clash of spray paint and the indescribable, alchemical darkness of an Old Master painting. Clorius has poached the pomp of 19th century painting conspicuously posing imagined figures and rendering them with minute detail. Any sense of rational perspective or naturalism however, is defied by his unsettling color palette, and surreal spaces, transforming a George Stubbs image of a horse into a metaphor. In Clorius’s artistic DNA is a sense of sorrow and stagnation, defiant longing and empathy brought to the surface through his use of political themes, the remembered architecture of his childhood, and art historical references. Clorius has exhibited widely in Maine and is the founder of Subone which advocates for an empowered use of art and graffiti within the community. Melinda Barnes is the most earnest archivist of all, for her archive, though often self-derived is fictitious. Her works continue like an ongoing travelogue or journal that depicts multiple viewpoints but never coagulate to form a complete narrative. Like Adriane Herman, Barnes gives us teasing, ephemeral moments like the ghost of an intravenous bag hovering in front of a desolate brick wall, branches outlined on bare clapboards, or a lone woman in a bar. Mimicking the scale and composition of snapshots but choosing to draw them with an innocent “comic-book” style, Barnes makes a quiet performance out of leaps in consciousness. Gently surreal and emotional, the ongoing force of creative life that spills from beneath the tiny drawings soft, stark surfaces is both sorrowful and softly humorous. Melinda Barnes is the recipient of the Juror's Prize for the 2008 Biennial Juried Exhibition at the Center for Maine Contemporary Art. Considerable Thinking will be on view from April 1st through April 25th. An opening reception will be held on April 3rd from 5-8 pm in conjunction with the First Friday Art Walk. 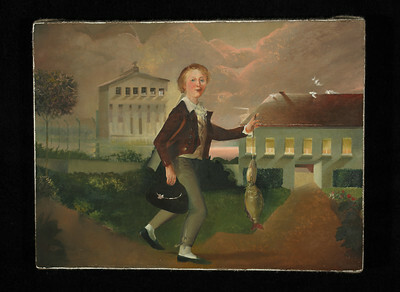 Tim Clorius, Wolfram G. Heim - Boy with Carp, 2008, oil on canvas Online Catalog. 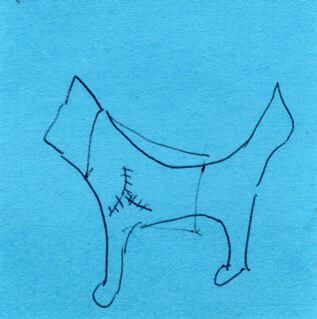 Adriane Herman, Sticky Situation (Pet Repair), 2009, woodblock print with silkscreen, 15 x 15 in.